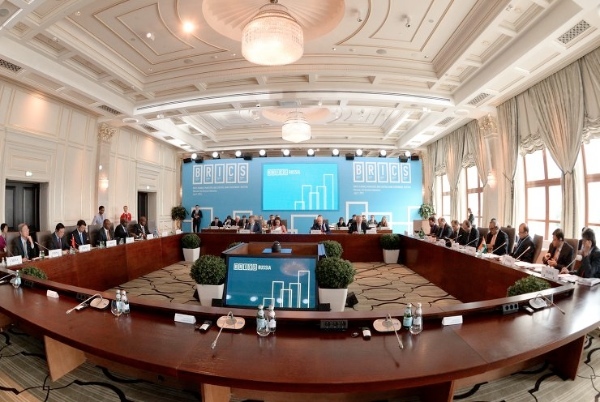 The long-heralded New Development Bank (NDB) or the BRICS Bank officially commenced business on Tuesday with the first meeting of its board of governors in Moscow. The NDB with about $50 billion in capital to invest in public infrastructure will compete with institutions where the US has considerably more influence—organizations such as the World Bank and the International Monetary Fund. The agreement was signed by the bloc’s five members — Brazil, Russia, India, China and South Africa — on July 15 last year during the sixth BRICS summit. The board of governors appointed members of the BRICS board of directors and the management led by the president, Kundapur Vaman Kamath. The board meet on Tuesday in Moscow also discussed rules regarding procedures and the bank’s five-year development strategy. The bank will aim to “promote reform of global economic governance” China’s Finance Minister Lou Jiwei had said earlier. The inaugural management team will take their posts in Shanghai in mid-July. The NDB is expected to launch late this year or early next year. The bank has an initial authorized capital of $100 billion. Its initial subscribed capital of $50 billion will be equally shared among the founding members. It will have a three-tier governance structure — a board of governors, a board of directors, a president and vice presidents. As agreed by the five countries, the first chair of the board of governors has been nominated by Russia, the first chair of the board of directors by Brazil, and the first president by India. An African regional center of the bank will be based in Johannesburg, South Africa. “The bank’s establishment will be an important achievement for financial cooperation among BRICS members,” said China’s Finance Minister Lou Jiwei. The Chinese government is providing $10 billion as prescribed for the initial subscribed capital. The BRICS central bank governors on Tuesday also signed an operating agreement on the $100 billion monetary fund. The BRICS Contingent Reserve Arrangement (CRA) will come into force on 30 July, Head of the Russian Central Bank Elvira Nabiullina said after the meet on Tuesday in Moscow. “Several other documents will be adopted to regulate the operation of governing bodies – the Governing Council and the Standing Committee,” said Nabiullina.